Historic Italian design and engineering firm Bertone is set to take over production of the TVR sports cars with the English automotive brand set to be officially re-launched at the Geneva Motor Show next March, well-placed sources have revealed. Ever since last Wednesday's shock official announcement that production would cease at the Blackpool factory, the tiny marque's long-term home, and move to Europe, speculation has raged as to the plans of its Russian owner Nicolai Smolenski. The tumultuous week of speculation came with an official announcement on Wednesday that TVR would quit the UK, itself a statement that arrived barely months after Smolenski had proclaimed that TVR would be moving to a new Blackpool site and would open a new head office in the region. The press release on Wednesday read: "Staff at TVR's Blackpool factory have been informed today that the company is planning to outsource all production. Agreements are being finalised for the 2007 run of Tuscan, Tuscan Convertible and Sagaris to be produced in Europe while fully built powertrains - straight six, four-litre TVR engines including clutch and gearbox – are due to be produced in the UK." On Wednesday Smolenski said: "We are extremely sorry that, after a period of uncertainty and raised hopes that we could continue production ourselves in Blackpool, we have had to make this decision. We need to secure the future of the company and move it forward. I am afraid we see no other way to do so." The statement then added that: "consultation has begun with staff and the Transport & General Workers Union on redundancy and counselling support is being put in place. 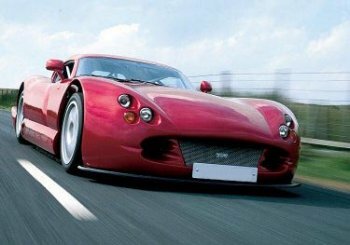 TVR plans to continue with all current arrangements for the supply of cars and parts. Discussions are being held with key suppliers about future relationships. TVR boss Smolenski continued to say: “We are acutely aware of the shock and distress this will cause for our staff and their families. We will ensure that we meet all our responsibilities towards them over the coming months. Bertone will assemble the initial new model range in its Turin factories. This range is expected to focus on heavily revised "Model Year 2007" versions of the Sagaris, Tuscan and Tuscan convertible sports cars. A new Cerbera (above) will also be added to the line-up next year. 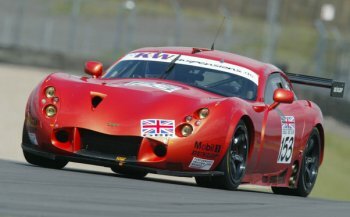 In recent years the TVR Tuscan model has been sporadically raced by several private teams with some factory support in a number of major sports car series' including the FIA GT and British GT Championship, as well as in the showcase Le Mans 24 Hours. Bertone is set to take over production of TVR sports car with the brand set to be officially re-launched at the Geneva Motor Show next March. 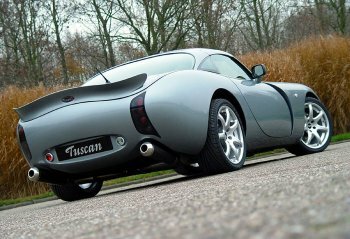 Above: The TVR Tuscan. "We would also like to express our gratitude to all those who have worked with us over the past months to try to maintain the company in Blackpool. We shall be making further announcements in due course about our plans which we believe represent a major advance for the proud name of TVR. But for the time being we are concentrating on our staff in Blackpool and the consultation process," added Smolenski. Italian design and engineering house are seeking to reinvent themselves after a quiet recent period and with Nuccio Bertone's widow Lilli now firmly at the helm and determined to push the famous name back into the spotlight. With a production run of tweaked Mini Cooper models (dubbed "Works Grand Prix") just behind them, Bertone have been recently been looking to build a new folding hardtop "coupé-convertible" model for Fiat Auto, based around their innovative Suagnà concept car which was revealed at this year's Geneva Motor Show, and which is developed on the new Fiat Grande Punto platform. Alongside this proposed project Bertone is also seeking to build a new-generation Alfa GT Coupé (they styled the very well received current model, which was developed on the Alfa 156 saloon's architecture) this time though it is expected to be developed around the platform of the next-generation Alfa 147, due to arrive in two years time. Bertone will assemble the initial new model range in its Turin factories. This range is expected to focus on heavily revised "Model Year 2007" versions of the Sagaris, Tuscan and Tuscan convertible sports cars. A new Cerbera will also be added to the line-up next year. The first MY2007 models will be presented at next spring's Geneva Motor Show where the marque will be re-launch in a blaze of publicity. The next major engineering contribution to the new cars will come from Ricardo plc, one of the world’s leading powertrain, driveline and transmission technology providers. 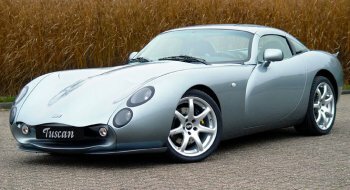 In August the reached an agreement with Smolenski which will see them take over full production of TVR's "Speed Six" 6-cylinder engine, re-working it to achieve EURO5 emission compliance, and major drivetrain components. Ricardo will now install a dedicated production line to build and assemble the drivetrains which will be shipped to Turin to be installed in the cars on the Bertone assembly line. Other major component suppliers have been retained, to ensure that as smooth a transition to the new geographical location is possible. 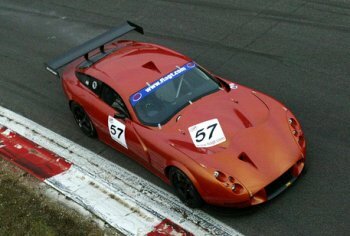 Meanwhile in Geneva next year TVR will also announce an ambitious new GT racing programme that will see the brand name well represented in top-class international GT racing. In recent years the TVR Tuscan model has been sporadically raced by several private teams with some factory support in a number of major sports car series' including the FIA GT and British GT Championship, as well as in the showcase Le Mans 24 Hours.